Luca + Danni creates handcrafted beautiful jewelry – from bangles to pearls to antique glass – and they have a sweet story. After losing his brother to leukemia in 2013, Fred Magnanimi carried on his brother’s dream of creating a unique, American made line of inspirational jewelry that tell a story. The fashionista in your life will be thrilled to find one of these in her stocking! Plus – they sell for $32 or less! The Holiday Collection is now available! Bangle bracelets are all the rage lately and I recently had the opportunity to check out Luca + Danni and see what they have to offer. I immediately caught sight of the Mother Mary Bangle Bracelet. While I am not a very religious person Mother Mary holds a strange meaning to me. When we moved into our house we scrubbed the place. Years later we found a Mother Mary charm and soon found out I was pregnant. The charm has been disappearing and re appearing at strange times during our lives in the past few years. Right now it is missing. I decided I wanted to keep Mother Mary close to me and jumped to receive the Mother Mary Bangle. The bangles come in two sizes regular and small as well as two color choices oxidized brass and silver plated. Each bangle is under $40 so these make a wonderful gift for someone special in your life. There are many varieties to choose from. 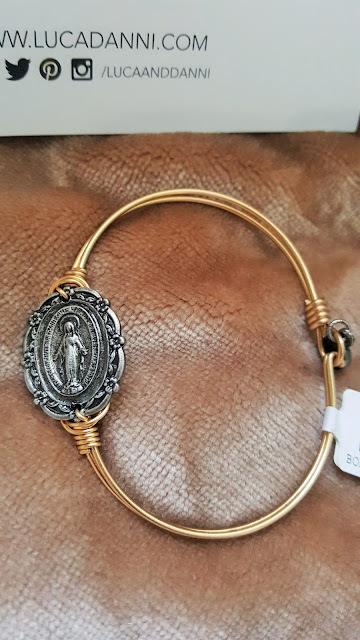 I absolutely adore my Mother Mary Bangle. It's beautiful and holds a special meaning to me. Right now Luca + Danni is offering free standard shipping with orders over $100!